It takes a big team to dream big at Hallmark. KANSAS CITY, Mo. — It takes a big team to dream big at Hallmark. Valentine's Day is filled with stuffed animals and handwritten cards. But, in a world that is so digital, Hallmark is having to get creative. 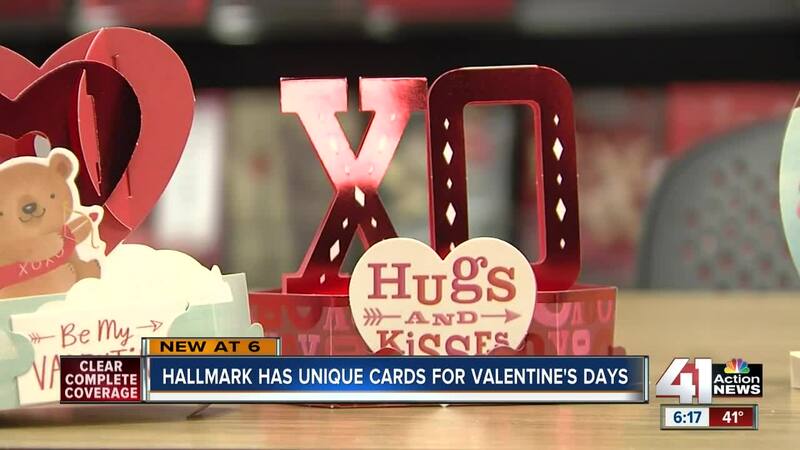 "A new idea is to just extend the regular open and close cards," said Cheryl Gaines, editorial director at Hallmark. "One of the things it's built on is the fact that we know people leave out their cards out after the holidays, during the holiday." The Kansas City-based company is changing the way people look at cards. As cards fly off the shelves this week at area stores, Daniel Miyares, a master artist at Hallmark, described one of this year's designs as a "displayable dimensional story" that ties into the relationship between one person and another. Their writers bringing in their own love stories. For Gaines, a trip to Paris served as inspiration for a recent card she worked on. The global card company is giving a new look to the holiday. "We are always looking for new ways to connect people and these are ways that I might connect with you over a card," Miyares said. "But, if it's on display your family might come in and say, 'Wow what is this?'" They hope everyone feels the love on Valentine's Day.